Describe atleast 2 reasons that a data provider may chose to store a dataset in a particular CRS. Reproject a vector dataset to another CRS in R.
Identify the CRS of a spatial dataset in R.
You often need to gather spatial datasets for from different sources and/or data that cover different spatial extents. Spatial data from different sources and that cover different extents are often in different Coordinate Reference Systems (CRS). The data are stored in a particular CRS convention used by the data provider which might be a federal agency, or a state planning office. The data are stored in a particular CRS that is customized to a region. For instance, many states prefer to use a State Plane projection customized for that state. In this tutorial you will learn how to identify and manage spatial data in different projections. You will learn how to reproject the data so that they are in the same projection to support plotting / mapping. Note that these skills are also required for any geoprocessing / spatial analysis. Data need to be in the same CRS to ensure accurate results. You will use the rgdal and raster libraries in this tutorial. There are many good sources of boundary base layers that you can use to create a basemap. Some R packages even have these base layers built in to support quick and efficient mapping. 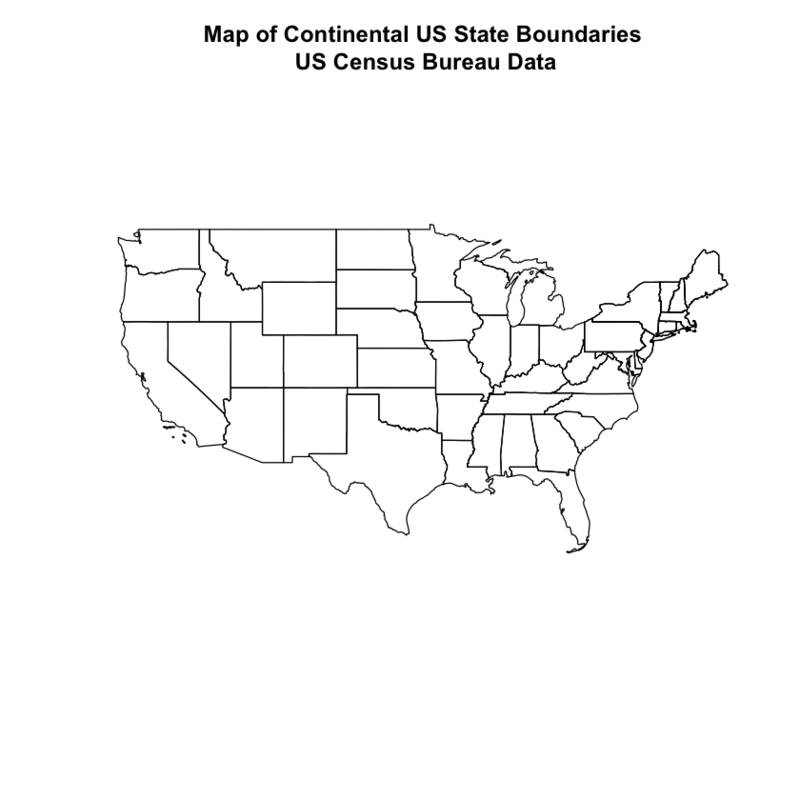 In this tutorial, you will use boundary layers for the United States, provided by the United States Census Bureau. It is useful to have shapefiles to work with because you can add additional attributes to them if need be - for project specific mapping. 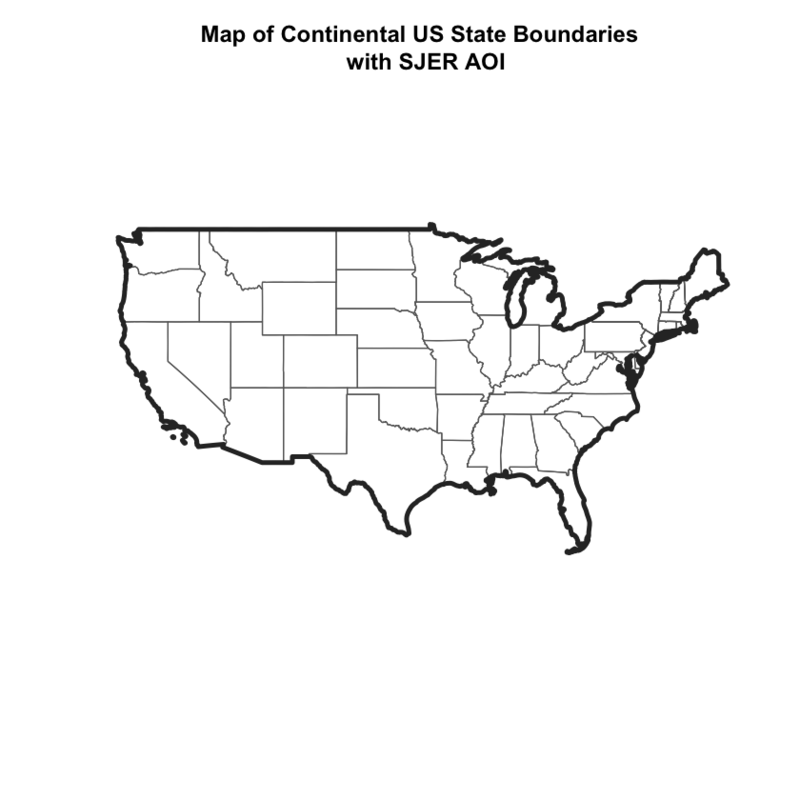 You will use the readOGR() function to import the /usa-boundary-layers/US-State-Boundaries-Census-2014 layer into R. This layer contains the boundaries of all continental states in the U.S. Please note that these data have been modified and reprojected from the original data downloaded from the Census website to support the learning goals of this tutorial. ## Source: "data/week-04/usa-boundary-layers", layer: "US-State-Boundaries-Census-2014"
Next, let’s plot the U.S. states data. You can add a boundary layer of the United States to your map - to make it look nicer. You will import data/week-04/usa-boundary-layers/US-Boundary-Dissolved-States. If you specify a thicker line width using lwd = 4 for the border layer, it will make your map pop! ## Source: "data/week-04/usa-boundary-layers", layer: "US-Boundary-Dissolved-States"
Next, let’s add the location of your study area sites. As you are adding these layers, take note of the class of each object. You will use AOI to represent “Area of Interest” in your data. ## Source: "data/week-04/california/SJER/vector_data", layer: "SJER_crop"
# plot point - looks ok? Your SJER AOI layer plots nicely. Let’s next add it as a layer on top of the U.S. states and boundary layers in your basemap plot. What do you notice about the resultant plot? 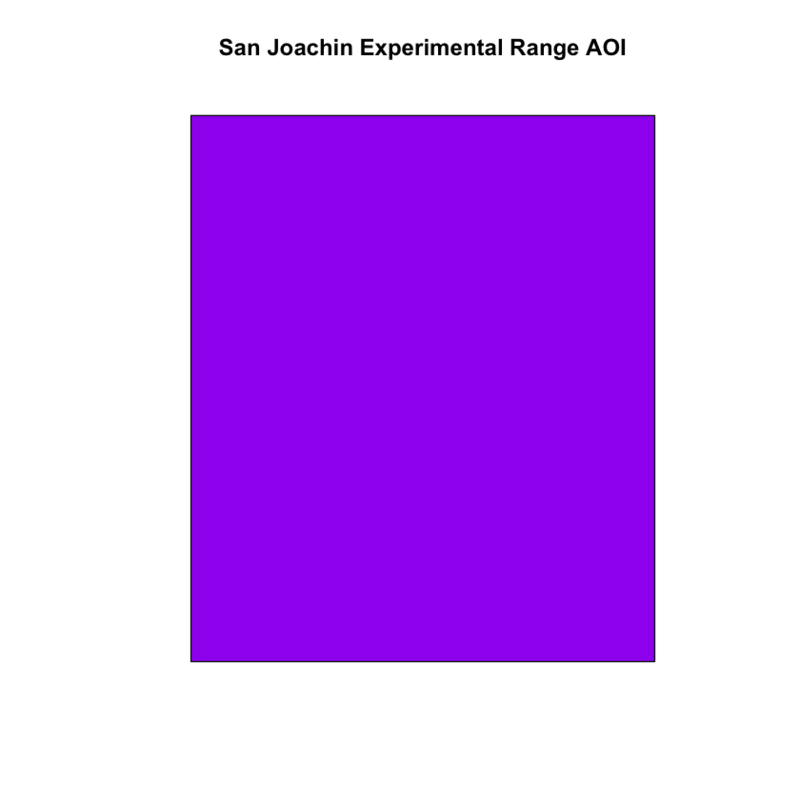 Do you see the AOI boundary in the California area? Is something wrong? 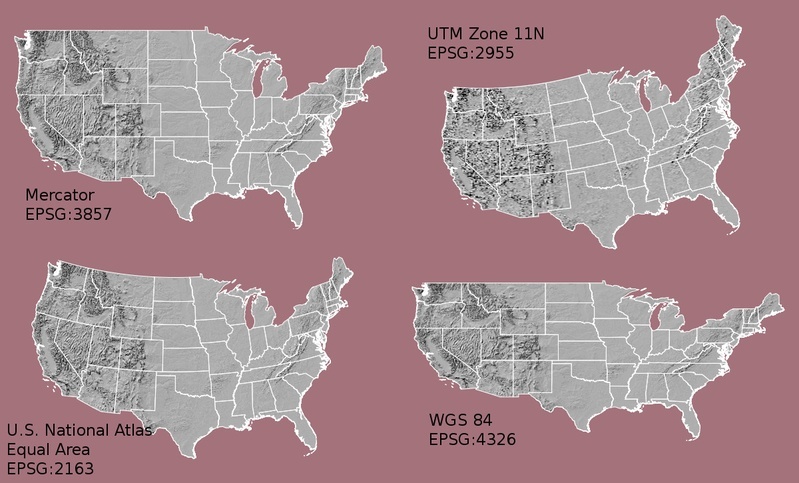 Let’s check out the CRS (crs()) of both datasets to see if you can identify any issues that might cause the point location to not plot properly on top of your U.S. boundary layers. It looks like your data are in different CRS. You can tell this by looking at the CRS strings in proj4 format. The CRS for your data are given to us by R in proj4 format. Let’s break down the pieces of proj4 string. The string contains all of the individual CRS elements that R or another GIS might need. Each element is specified with a + sign, similar to how a .csv file is delimited or broken up by a ,. After each + you see the CRS element being defined. For example projection (proj=) and datum (datum=). Note that the zone is unique to the UTM projection. Not all CRS will have a zone. Note that there are no specified units above. This is because this geographic coordinate reference system is in latitude and longitude which is most often recorded in Decimal Degrees. Data tip: the last portion of each proj4 string is +towgs84=0,0,0 . This is a conversion factor that is used if a datum conversion is required. You will not deal with datums in this tutorial series. Next, let’s view the extent or spatial coverage for the sjer_aoi spatial object compared to the state_boundary_us object. Note the difference in the units for each object. The extent for state_boundary_us is in latitude and longitude which yields smaller numbers representing decimal degree units. Your AOI boundary point is in UTM, represented in meters. To view a list of datum conversion factors type: projInfo(type = "datum") into the R console. Now you know your data are in different CRS. To address this, you have to modify or reproject the data so they are all in the same CRS. You can use spTransform() function to reproject your data. When you reproject the data, you specify the CRS that you wish to transform your data to. This CRS contains the datum, units and other information that R needs to reproject your data. Data Tip: spTransform() will only work if your original spatial object has a CRS assigned to it AND if that CRS is the correct CRS! Next, let’s reproject your point layer into the geographic - latitude and longitude WGS84 coordinate reference system (CRS). # does the extent look like decimal degrees? Once your data are reprojected, you can try to plot again. But now, the AOI is a polygon and it’s too small to see on the map. Let’s convert the polygon to a polygon CENTROID and plot yet again. Reprojecting your data ensured that things lined up on your map! It will also allow us to perform any required geoprocessing (spatial calculations / transformations) on your data. Import the madera-county-roads/tl_2013_06039_roads.shp layer located in your week4 data download. 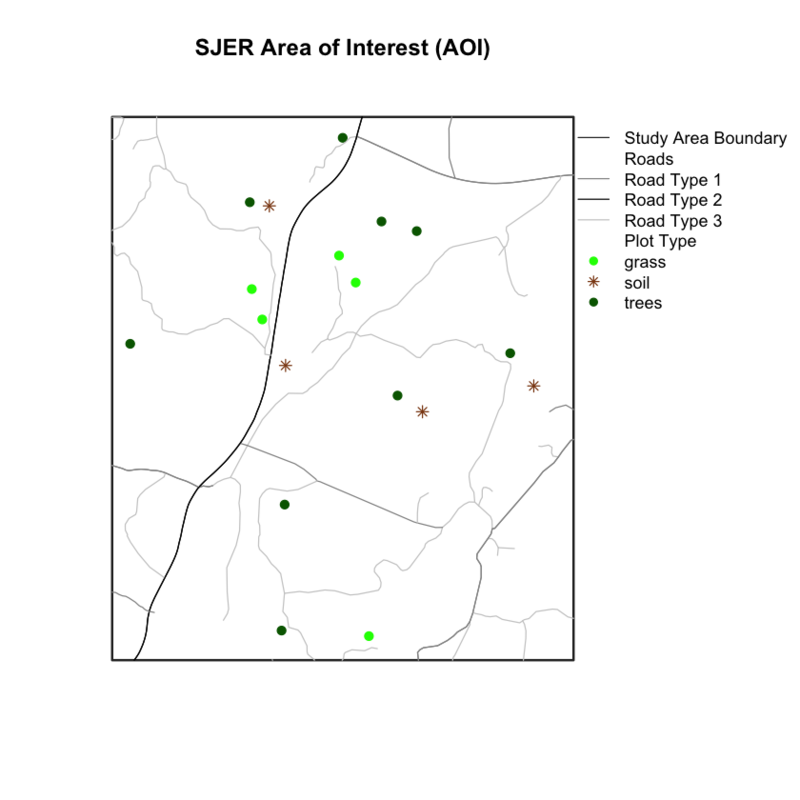 Create a map that shows the roads layer, study site locations and the sjer_aoi boundary. Add a title to your plot. Add a legend to your plot that shows both the roads and the plot locations. Plot the roads by road type and add each type to the legend. HINT: use the metadata included in your data download to figure out what each type of road represents (“C”, “S”, etc.). Use the homework lesson on custom legends to help build the legend. BONUS: Plot the plots by type - adjust the symbology of the plot locations (choose a symbol using pch for each type and adjust the color of the points). Do your best to make the map look nice! IMPORTANT: be sure that all of the data are within the same EXTENT and crs of the sjer_aoi layer. This means that you may have to CROP and reproject your data prior to plotting it! NOTE: this is also a plot you will submit as a part of your homework this week!